LIVERMORE — For the first time since fire destroyed the barn and ice house in 2008, the Norlands will host an ice harvest for the public from 9 a.m. to 2 p.m. Sunday, January 27. Director Sheri Leahan said five or six staff/volunteers will be on Bartlett Pond. 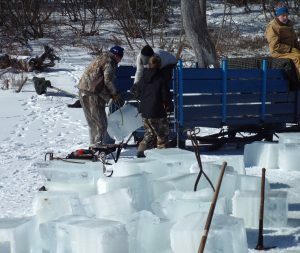 12-18 inch blocks of ice will be cut, transported by horse-drawn wagons and stored in the ice house. Visitors can step in to help at any stage in the process. The ice house, a room in the new barn, will hold close to 300 blocks of ice depending on how they are cut. 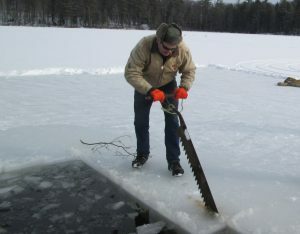 “We cut ice last year for staff training. The goal is to fill the ice house entirely this time,” Leahan said. “There will be at least three teams of horses, maybe a few more. They are members of the Maine Draft Horse and Ox Association. Please note that no wagon/sleigh rides will be offered. Visitors are encouraged to park by the pond and drive up to the Norlands to see the ice house. Warm up with a bowl of soup and a biscuit ($3) served in the farmer’s cottage at Norlands from 10 a.m. to 2 p.m. (while supplies last). Coffee and hot chocolate will be available all day. Guided tours of the 1867 Washburn family mansion will be offered at 11 a.m., noon, and 1 p.m. Tickets are $5 and may be purchased the day of the event. In case of bad weather, this event will be canceled by 9 a.m. Sunday, Jan. 27. Call the Norlands at 897-4366 and listen to the outgoing message, visit www.norlands.org, or check the Norlands Facebook Page for updates.